A reliable source for Parts Cleaning Equipment information and a resource for accessing leading Parts Cleaning Equipment and suppliers. Parts cleaning systems are machines that act as one of the last steps in parts manufacturing. They are designed to clean, degrease and dry mass quantities of small or large parts before they are surface treated and shipped for distribution. Newly machined, forged or fabricated products are usually coated in oils, chemicals, burs, abrasive dust, debris, paint and other residue left over from the fabrication process. Finishing coatings such as zinc and electroplating are not effective if they are applied on a dirty surface. Parts Cleaning Equipment Parts cleaning systems are machines that act as one of the last steps in parts manufacturing. They are designed to clean, degrease and dry mass quantities of small or large parts before they are surface treated and shipped for distribution. Parts cleaning equipment may be manually operated, semi-automatic or fully automated and controlled by a CNC (computer numeric controlled) system or PC software. Since no single parts washer is designed to effectively clean every product, there are many different kinds available that are composed of different equipment and components. 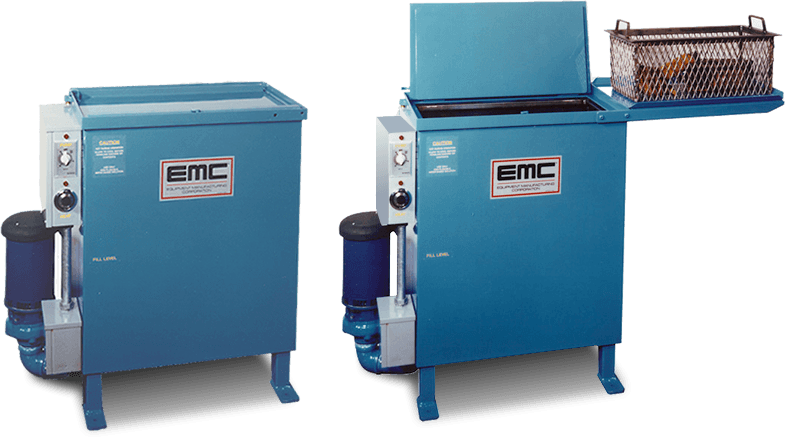 The right type of parts washer depends on the size and design complexity of the part, as well as the surface material and the contaminants to be cleaned. All parts cleaners are made of certain components, including some sort of conveyor belt, a housing that is usually made of stainless steel, heaters that maintain the water and cleaning solution temperature and high pressure pumps that provide water. Most are equipped with a drying system, which can be a series of cold air guns or heaters. There are four main types of parts cleaning systems, each with their own equipment. Agitating parts washers are composed of impellers or paddles that create a vibrating action to help remove grime from fully submerged parts. These parts washers require large holding tanks and aqueous cleaning solutions. Rotary washers have a rotating, cylindrical tank that is effective in cleaning large volumes of small products by continuous movement. These use sprayer nozzles to help clean the parts. Spray washers use high pressure water nozzles that shoot out warm water and cleaning solutions and rely on water pumps to provide the water pressure necessary to clean the part surfaces. These are used to clean larger parts. Immersion parts washers submerge parts into large water tanks and rely on some sort of cavitation-inducing equipment, like ultrasonic sound waves or propellers to remove dirt and grime from parts. In order to maintain a clean water tank, all parts cleaners are equipped with some sort of filtration system to collect the waste and debris. Small parts washers usually contain the parts in baskets, while large parts washers set the parts down on conveyors.